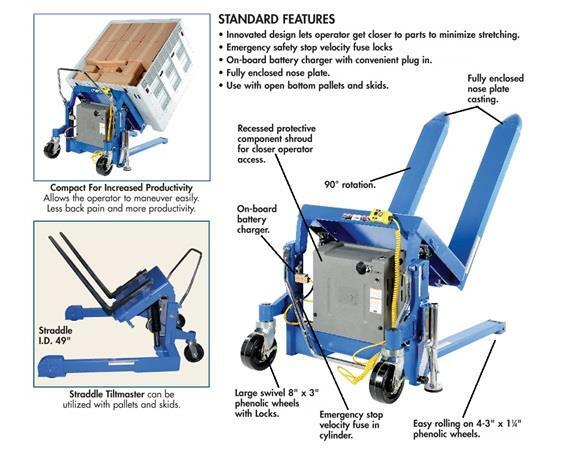 The Tiltmaster | David's Inc.
One operator lifts and positions filled tote boxes or baskets without the need of a fork truck or lift table. Completed work may be moved to the next work station without waiting for a fork truck. 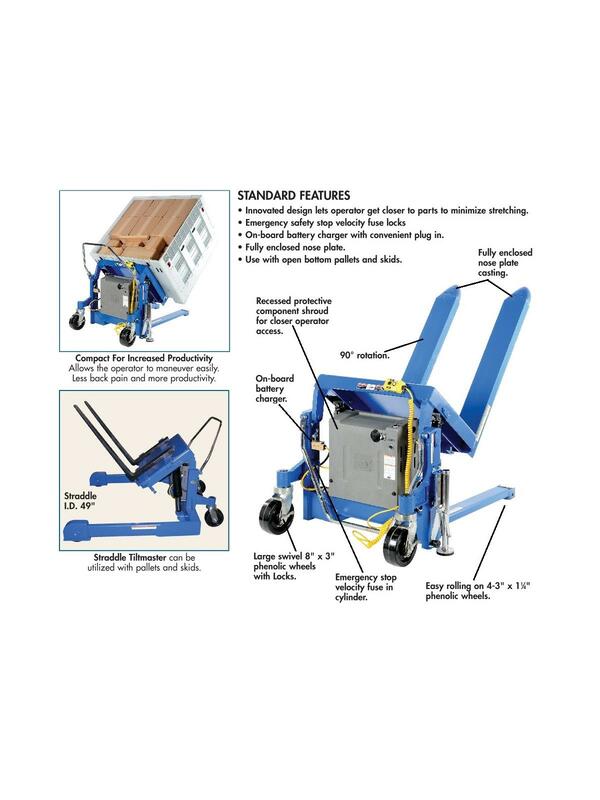 Lift and position filled tote boxes or baskets without the need of a fork truck or lift table using the newly designed heavy-duty Tilt Master. These 90 degree tilters will function as a transporter by moving completed products from work station to work station without waiting for a fork truck. A folding ergonomic handle has dual steering grips for quick and easy maneuverability. Unit has a thin profile to allow the user to get as close to the load as possible. Units roll easily on 8" x 3" phenolic steering wheels and feature a floor lock. Series TM are to be used with open bottom pallets or skids only while the Tilt Master Straddle units, series TMS, can be used with virtually any kind of container or pallet. Units are powered with a 12V DC electric motor including an on-board battery charger standard. AC or *AIR/OIL power units available contact factory (*filter - regulator - lubricator required). Comes standard with a push-button hand control on an 8 foot coil cord. Battery Charge Indicator Gauge now standard. FOB Shipping Point. - Innovated design lets operator get closer to parts to minimize stretching. - Emergency safety stop velocity fuse locks. - On board battery charger with convenient plug in. - Fully enclosed nose plate. - Use with open bottom pallets and skids. 41 x 75-9/16 x 28-5/16"41 75-9/16 28-5/16"